Tape backups were once the go-to choice for companies to backup their files and records that are both reliable and cost-effective. 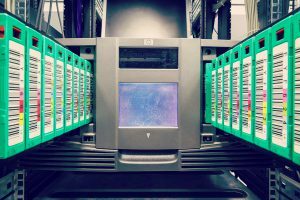 Advancements in technology are moving away from backup tapes as a source, but there are many companies out there that still store their old data in this medium. Due to the nature of their design, backup tapes require a controlled environment that allows them to last through the years. Record Nations works with local tape vaulting services that can store your tapes in a climate-controlled, physically-guarded facility. While some businesses may choose to store their tapes onsite in a seemingly “safe” place, the truth is, these tapes require specific environments to prolong their lifespan. Local tape vaulting service providers are available throughout the country that specializes in taking special care of your backup tapes to ensure that they remain safe. Our offsite facilities are monitored by security guards and offer control on temperature and humidity that is ideal for the backup tapes. And of course, you can always retrieve your tapes to backup any information when you need them. In accordance with vaulting services, tape rotation is an important step to make sure your backup tapes remain safe. Tape rotation allows the data contained in the tapes to be accessible without fail, protecting them from excessive wear and damage. Tape rotation frequencies can be determined by the company’s specific needs based on the importance and volume of data. Smaller companies may choose a simple and cost-effective plan while extremely sensitive data should choose a more sophisticated, rotation program. Get Free Quotes on Backup Tape Vaulting and Rotation Services Near You! Record Nations works with a nationwide network of locally-based and operated vaulting services, including backup tape rotation. We find the service providers that can meet your requirements and offer their free quotes, all in just minutes!